A lot going on there. Still can't own up to the fact that nothing but his own conduct is responsible for this ending. Of course people forgive conduct. That doesn't mean your qualified to continue to run a Catholic Apostolate at EWTN. May I suggest as many as possible write to Mike Mishol the SE Regional Rep for EWTN mmishol@ewtn.com. Poor Mother Angelica she is not happy! IMO, I think the problem with Mark is behind us. I definitely think we should reach out to them about Simcha about the posts below (and others). Let me know how you make out. I think the content will unfortunately need to be taken to senior leadership. Shea's thinking is absolutely delusional. The man obviously has some kind of mental health problem. I suspect he's either a borderline or an outright psychopath. I hope his family is watching him closely, for I fear he might really become dangerous to himself and others in the near future. So he continues to attack anyone who pointed out his boorish behavior. 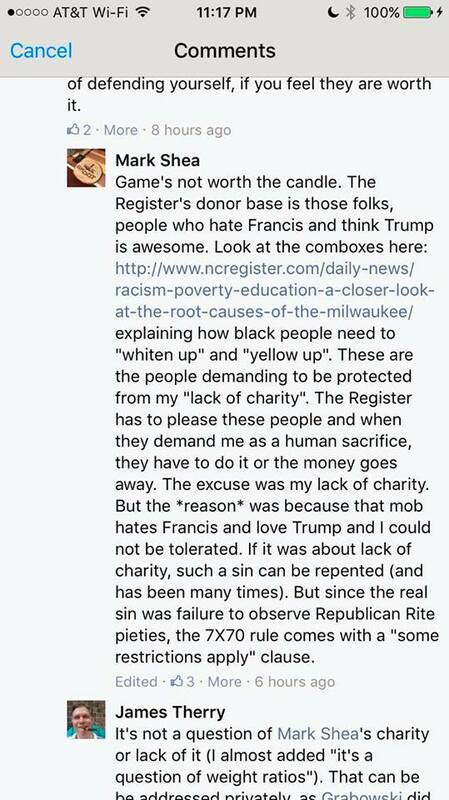 I guess he thinks his use of "Republican Rite piety" is humorous. I think he needs to read "The Backbiting Tongue" and consider what his career choice is doing to his soul. And don't forget that he was fired by all those who "hate Vatican II"! Yeah, all those meanies who do not agree with him. There are some pamphlets and other things that I was looking to order for the adoration chapel but some had input from this man and so I decided not to order them. I will not be party to anyone looking to hm. M. Prodigal, good idea. Boycott Shea and any Catholic affiliation that has anything to do with him including Catholic Answers. EWTN Inc. gas got to decide if they are solidly Catholic or trying to become a sort of snappy, snarky, sound-bite, neo-Catholic, ex-Protestant, "read my lastest book on the Bible" shill. I have found several of Shea's comments to be too "francisish". We are either Catholics holding to the Truth or we are weeds bending in the breeze. Peace and God bless. He and his/Simcha's supporters keep nattering on about a "Republican" conspiracy against them, which is purest nonsense. Where is there a group of "Republicans" sufficiently in agreement with each other to conspire against a couple of minor league catholic internet jockeys? The party is in tatters! Have they not noticed? 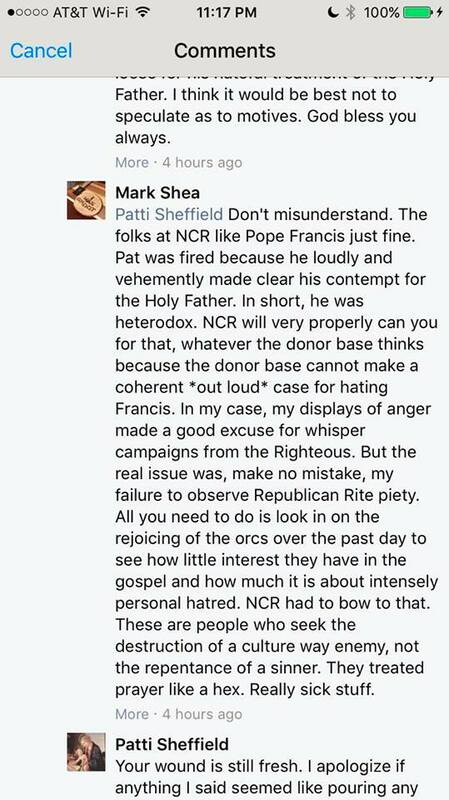 and why are all these ostensible "supporters" on the NCR FB page saying the same exact thing -- that it's the doing of "Republicans"? I detect astroturf. 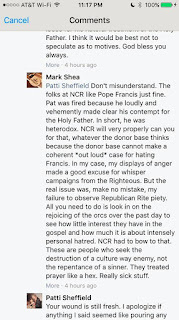 In those two posted comments Mark Shea either is deluded or is face-saving by lying through his teeth. The simple truth: He was fired for lack of charity. That lack has been long evident wherever he has posted and commented, and has been long noted on the internet. It finally caught up with him. Amazingly, it still continues, as seen in his two posts above. Does it not occur to him to turn a new leaf and apologize now, to all the people he has been uncharitable towards with his insults and diatribes? 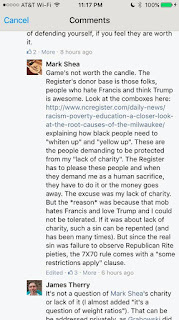 What is the point of his being Catholic, if he cannot be charitable? "What is the point of his being Catholic, if he cannot be charitable?" Shea is a con man, first and foremost. His "Catholicism" makes L. Ron Hubbard look like Marcel Lefevbre.